The CWA bargaining teams for AT&T Midwest and AT&T Legacy T will meet with AT&T on Monday. The Union's position remains unchanged: AT&T must stop its practice of offshoring and outsourcing work to the lowest bidder and decimating good jobs in our communities. 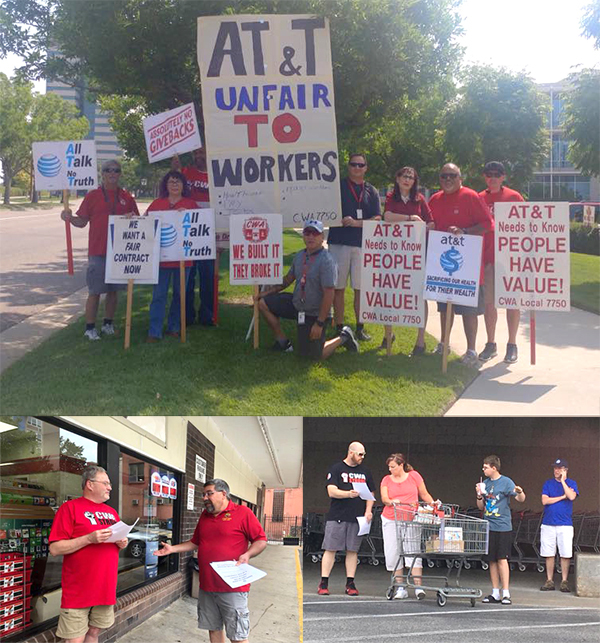 As the bargaining team prepares to return to the table, CWA members at AT&T Legacy T are mobilizing, including leafleting the public to raise awareness of workers' fight for a fair contract. The CWA Piedmont bargaining team met with the company and the mediator on August 8-10 in Washington, D.C., at the National Mediation Board (NMB) offices. The next round of bargaining is scheduled for September 11-13 in Pittsburgh. Although there was a large gap between the proposals at the start, the bargaining team has made significant headway in closing the gap, presenting several options to narrow the gap and reach an agreement. But there is still a ways to go to reach a fair and equitable tentative agreement. Each of the CWA bargaining team's proposals included back pay to January 1, 2018. None of the company's proposals included back pay, but did include a signing bonus, with the company claiming that their willingness to provide back pay to January 1, 2018, was tied to the original tentative agreement. Sign the letter here to tell Piedmont to give agents the fair wages and retroactive pay they deserve. Last week, members of the CWA Piedmont bargaining team held a town hall call to update members on progress in mediation, and to urge members to ramp up the pressure on Piedmont to make the movement that agents need to reach a fair agreement. Member mobilizers talked about all the activity going on at stations across the country and how you can get involved. Listen here. 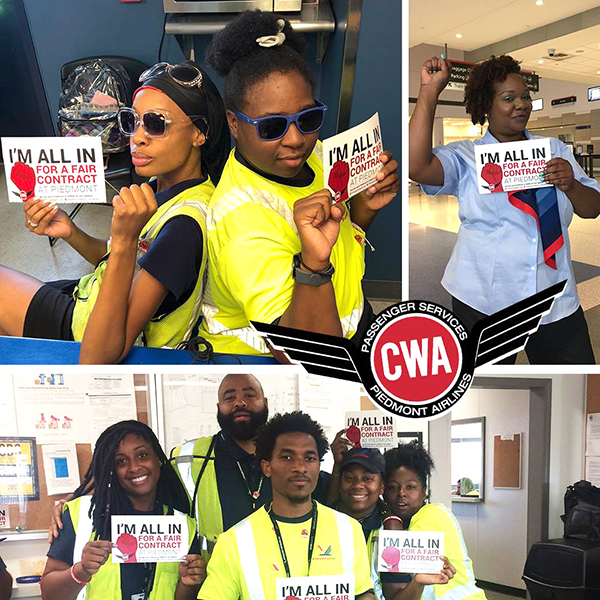 Piedmont Airlines agents are mobilizing across the country to show the company that they are united in their fight for a fair contract.